I'd been having a lot of issues about what pdf viewer to use with my Macbook Pro and desktop machine (both running current system software) in combo with Docear. I really needed to get those highlights and notes coming through once I was bringing in my annotated pdf files. After reading the documentation for Docear it was looking more and more like I might not be able to use the software. I'd tried using Adobe Acrobat but the annotations weren't coming through for me. Plus I can't afford it. Preview was going to be problematic as noted in the documentation and so was Skim. I ended up with Skim though after some fooling around. As documented Skim outputs a saved file that doesn't allow Docear to import the annotations. It does allow annotations to be brought in if you export the pdf file with "notes embedded". The down side is that you lose the ability to edit the annotations in the exported file. The solution . . . though slightly tedious, was to output a version of each. One "saved" that retains editability and one "exported" for use in Docear. If I have to go back and re-annotate then I can do so and output a new "exported" file for Docear. It's workable. Mostly I just need to get my thesis completed and I was going nuts with alternate approaches. Unfortunately it's not all that fun and friendly. The pdf's require care and consistency. Out of nowhere one of my precious pdf files did not record highlights. Notes yes, highlights no. I tracked it down. It was because the original file got saved in Apple Quartz formatting. I have no idea which one of my regular programs did this but I will track it down and kill it. The article in question was one of the major ones that develops the interior aspect of the thesis. It's fixed and happy now. Docear continues to work in my favor. Additional problems that are still workable. In Skim if there are two columns for a pdf file you lose linear context for the display and sequencing of notes and highlights. The highlights display based on their physical location on the page . . . not on where they are located in regards to first paragraph and last paragraph on the page. In some cases it's not a problem but in many it is so end up rebuilding the pdf file in a text editor and re-outputting as a single column display in pdf format. Again. It's nuts how I'm doing it but it works and I still need to finish this thesis off in a kindly fashion. This ain't so kindly but I'm holding my cookies together nonetheless. and thanks for telling us. We know about the problems with OS X systems and Docear. Unfortunately we were not able to improve the situation yet. However, Adobe Pro should work. If you only can't import highlighted text that is because Docear can't import highlighted text natively. For a workaround we recommend the PDF X-Change viewer (a PDF viewer for windows) which can automatically create notes from highlighted text. For a workaround in Adobe Pro you could create a note and copy the highlighted text into it. While this is not really user friendly it might be easier than the solution you currently work with. On Linux (I am a Linux user) the situation is somewhat similar to OS X. 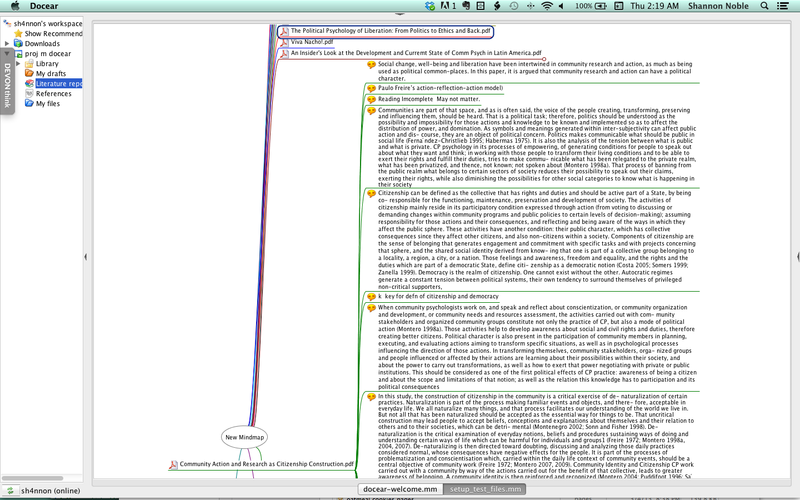 There are PDF viewers capable of creating annotations inside the PDF file. But you also have to export the file with embedded annotations. I use the PDF X-Change viewer inside WINE (WINE can run a lot of windows executables). after being forced to use a Mac, I've searched for a good PDF reader, which does integrate well with Docear. First, I didn't try Skim, because it is not recommended at all on the PDF-reader support site in the Docear Manual. 1. Create annotations/notes/highlights with skim in a pdf file. 2. Export the file and choose "PDF, with embedded notes". 3. Docear can import the annotations/notes/highlights. And they are also editable and show up in Skim. 4. However, the annotations are not editable anymore via Skim. To overcome this, every time you open the PDF with Skim you need to choose File>Convert Notes to convert PDF-notes to Skim notes. The "Jump-to-page support" does not work, but this is not crucial for me. I suggest, you update the table in the Docear manual, so a new user does at least give Skim a try. Thanks. Version: 1.0.33.2 ; Page loaded in: 0.077 seconds.